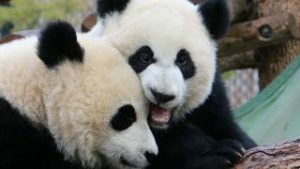 Another year of conservation work is in the books, and Donna Sheppard and her team have been busy! Donna and other members of our Conservation Research Team have been busy sifting through information and measuring data collected from the Wechiau Community Hippo Sanctuary this past year. The WCHS was formed in 1998 and over the past 19 years has expanded local conservation and business opportunities, including the successful opening of a shea nut ‘factory’ in 2014. 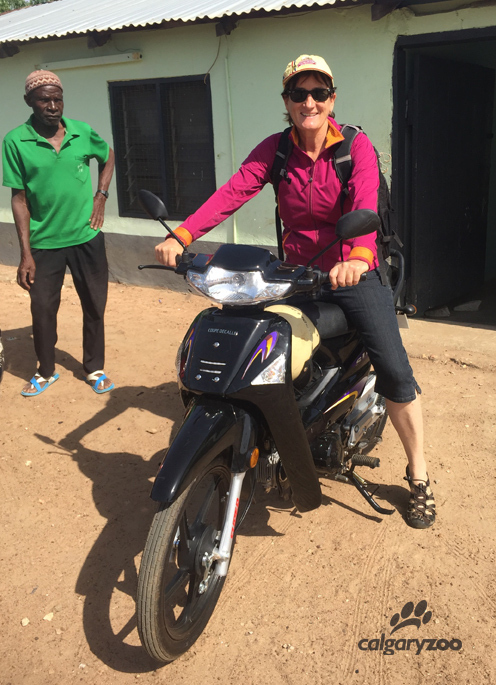 Donna returned to Wechiau, Ghana, for two months in 2016 to visit old friends and conduct surveys in the area. This busy visit created results for 15-20 surveys. Using trained local tour guides and scholarship graduates from Wechiau, Donna collected data on diverse topics including: measuring the hippo population and area bird life; documenting fees paid by tourists and the impact on the women involved with the shea nut cooperative. Her work also included interviews with 400 locals to measure their attitudes towards the environment with the addition of the Hippo Sanctuary. 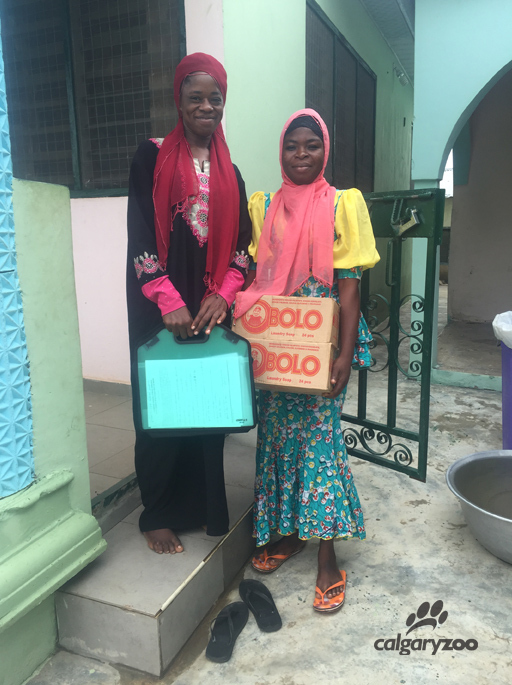 These two young women were trained by Donna to work on one of the surveys. It was such an amazing learning experience for them. One survey in particular excited Donna. While visiting Ghana, she was able to collect data on the Black Volta River, searching for new hippo populations. This became a real expedition that included moving their motorcycles and bikes across flooded areas that had swelled during the season. They explored further north up the river than Donna ever had traveled before, (along a 40 km stretch of the river linked to the northern boundary of the WCHS-protected section of that river) which was a rewarding experience, as a small group of hippo were located- but the weather during the trip left her “the hottest that she had ever been.” It was also the hottest that the head guide of the hippo sanctuary had ever experienced- 45 degrees at dark when the sun went down without a breeze! Donna takes her field bike out for a spin. The team were able to inspect the condition of the riverbanks in WCHS territory, which are free from farming, and therefore are better preserved with less erosion occurring. Compared to unprotected areas further up the river where farming has significantly impacted the river landscape, the good work of the WCHS becomes clear. This group also began spotting hippos tracks meandering through a tobacco farm, including the tracks of a very young baby hippo! Donna was especially thrilled to discover a small group of hippos about 40 km up-river from the hippo sanctuary. 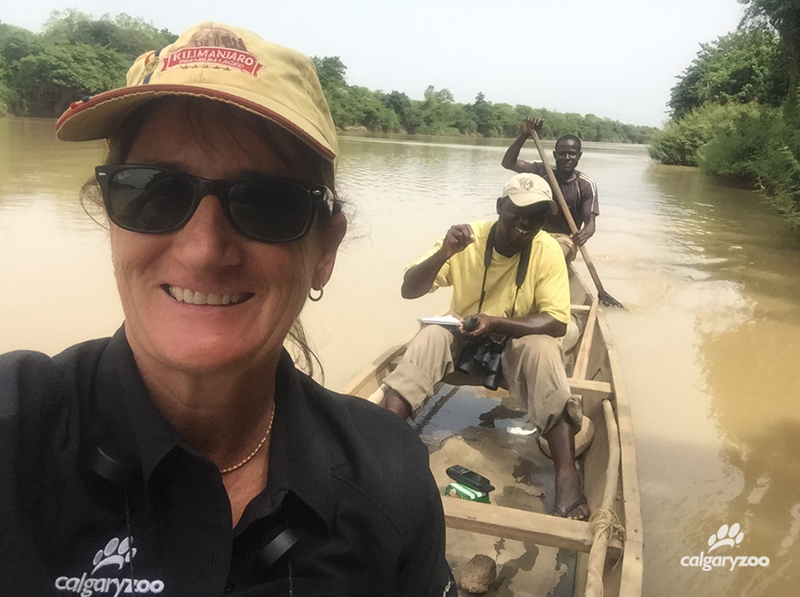 Donna with the hippo survey team on the Black Volta river north of the hippo sanctuary. The success of the Wechiau Community Hippo Sanctuary in protecting local hippos is heartening. Knowing that there are more populations of wild hippos along the river means there are more possible locations to preserve these incredible mammals. Surrounding communities have similar reverence for hippos, and Donna sees opportunity to use lessons and successes from the WCHS to help preserve more wild spaces. This research and fieldwork is in collaboration with our partners, the Wechiau Community Hippo Sanctuary, Nature Conservation Research Centre and the Savannah Fruits Company.